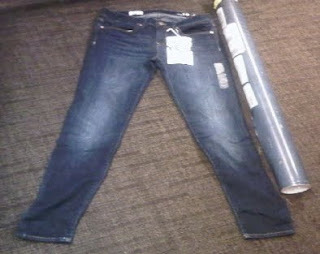 As a GAP Brand Enthusiast I received a free pair of their denim leggings this week. The new super skinny jeans are also super soft, yet also a little stretchy and breathable. They come in a variety washes--dark to faded grey to black. Trying on these jeans was also a good reminder that I can use a trip to the gym again ;) However, a coworker did ask me who made my new jeans and was surprised when I said GAP. I still wear my GAP jeans from my pre-baby days. I LOVE them! I am a Gap convert now that their 'short' lengths actually work on me! denim leggings?! that's an interesting concept. :) i'm down for a free pair of GAP jeans! i LOVE gap jeans. it's the only brand i buy on a regular basis. they also always have the BEST sales, you can get amazing jeans for like $10. too legit! Oh my! I've been eyeing these jeans! And currently don't own a single pair that actually fit! So..yes please!!! Gap jeans fit so nice and snug. Like a bug in a rug!! jmprice22 at gmail dot com!! I only wore GAP Jeans growing up, I phased out for a while but have been dying to give them a try again after seeing so many new styles! I've never worn gap jeans but would love an opportunity to try them! Thanks for hosting a great contest! Not gonna lie...pretty sure I spilled a mysterious pickle substance on my favorite jeans. Might be time for a new pair! lauraereeve at gmail dot com! I'm not a leggings fan, but I do love me some Gap jeans! the gap real straight jeans have become my absolute favorite. they are so awesome. i have been thinking about getting a pair of gap jeans - thanks for the giveaway! I actually worked at GAP for most of my high school career! I can't wait to try their legging jeans; they look so great and comfy! I have a pair of Gap jeans I received at Sara's party last year when I was pregnant...I wear those jeans more days out of the week than I can count! Hi there ;) Fun giveaway! I LOVE my GAP skinny jeans and am so curious about the leggings - (though am glad they are not calling them jeggings - that word kind of weirds me out). But the $69.50 would be sweet. I haven't tried GAP jeans in ages, but I'd love to try a pair! We have a GAP right down the street from my office, I need to go check it out. I ADORE Gap jeans, they have always fit me so perfectly!! this is a great giveaway! i love the GAP. Always classy. I used to be a huge fan of Gap jeans, then they redid their fits a few years ago and I didn't go back. Would love to try them again! Good old trusty GAP jeans! The new denim leggings look great! I love GAP jeans and are ready to get some new ones for the fall! Denim leggings. I've been wanting to try those.